This past weekend, I was up in Manchester-by-the-Sea to kick off summer. I spent the day at the beach, took a break to regroup, then returned that evening for a casual evening picnic. The start to summer -with long sunny days and crisp evening breezes-is by far my favorite time of year. I selected easy-to-prepare, travel-friendly dishes inspired by my trip to New Orleans. The star of the picnic was a wonderful layered Muffaletta sandwich. 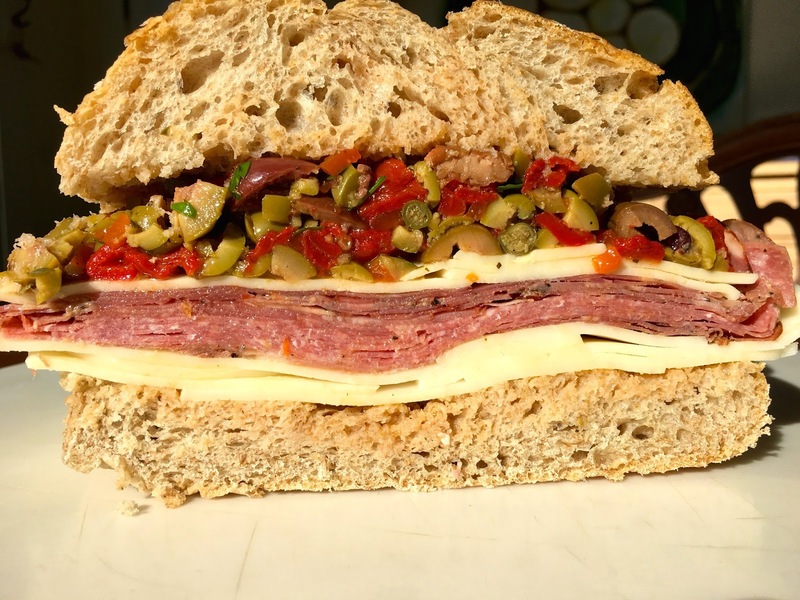 First created in the early 1900’s at the Central Grocery in New Orleans, the Sicilian-inspired sandwich combines cured meats and preserved vegetables piled inside sliced bread (instead of alongside it, which was the classic lunch fare of that time). I began with the pickled vegetables, tweaking the classic recipe a bit with the addition of Greek Kalamata olives and some capers. I spooned the veggies atop half of my fresh focaccia loaf (I couldn’t find a Muffaletta loaf on the North Shore so had to improvise), then rapidly layered slice upon slice of the sliced meats and cheeses. I wrapped the sandwich tightly, placed it in a cooler with some cajun cole slaw and potato salad, put on a sweater, packed the car, and was back beachside as if I had never left. 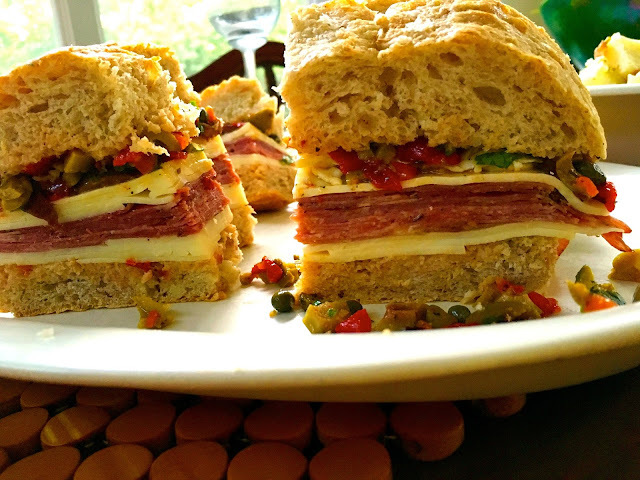 Once my family and friends were seated on beach chairs with a cold drink in hand, we sliced into the the Muffaletta, eager to see the assortment of layers inside. In a medium bowl, stir together the pimento-stuffed olives, Kalamata olives, roasted red peppers, capers, flat leaf parsley, oregano, red pepper flakes, garlic, red wine vinegar, EVOO and salt and pepper. Cover and let meld for at least 1 hour in the refrigerator. Cut the Italian bread loaf in half on a work surface. Spoon the olive salad on the top half of the bread and spread evenly. On the bottom half off the bread, arrange the mozzarella, then capicola, then salami, then deli ham then provolone cheese. Carefully close the sandwich. Wrap the sandwich tightly in plastic and place in the refrigerator for 1 hour. Unwrap the sandwich, cut into slices and enjoy. Serves 6. I will be making variations on this beach-friendly stack all summer and encourage you to do the same!